In the age where everything is possible using digital special effects it's pure magic watching a film like Fitzcarraldo. It's magic is that there are no special effects and what you are seeing is real, pure and simple. If you don't know the film, it's story involves a failed entrepreneur (Klaus Kinski) who comes up with a brilliant idea on how to tap into an unused rubber tree forest. There are two rivers and only one is accessible, the other river has impassable rapids. 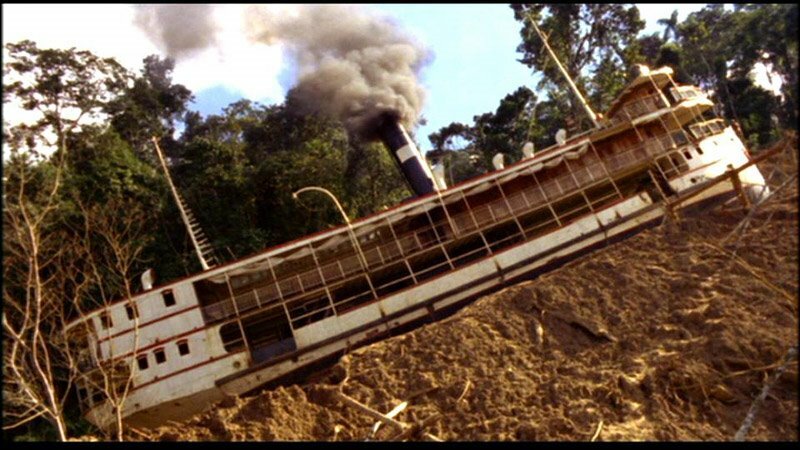 Kinski's character, Fitzcarraldo, sees a point on the map where the two rivers are very close together so he schemes to take a boat to that point, drag the boat over the mountain and then be able to run a river boat above the dangerous rapids. He would take the untapped rubber trees up to the same point, take the trees over the mountain and down the safe river. Exasperating his problems, the point at which the rivers meet is in the land of a tribe of natives known for headhunting. Fitzcarraldo ends up using the tribe for labour but isn't sure of the reasons behind their assistance. It is a great source of tension throughout the film. Behind all of this ambition is Fitzcarraldo's love of the opera. His real dream is to make enough money to build an opera house deep in the Amazon. The film is one of those great movies that, despite it being too long and meandering, transcends it's flaws. Part of this is from Herzog's insistence that he puts reality before the camera. No special effects allowed. Having seen it and knowing what you were seeing was real has a profound effect. Herzog even strips his style down where it often feels like a documentary. It doesn't take much imagination to see how difficult it would be to pull a river boat over a mountain and to top it all off, the river boat ends up running down the other river and through the rapids. This sequence was simply riveting as Herzog had cameras in the boat as it ran violently down the river. It's easy to forget in the modern day just how exhilarating real images are. I think back to those huge films of the past where armies of people gathered to make a film. I think of Lawrence of Arabia where thousands of men clash in immense battle sequences. Or the Jungle exploding in Apocalypse Now and even the intimate scenes of the drunken Martin Sheen breaking down. Herzog is quite right in attempting to capture a large degree of reality as reality is powerful. Fitzcarraldo's story is about dreams and one's own obsessions. It is a classic example of man vs man, man vs nature and most of all, man vs himself. How do we overcome our own obsessions? How do we accept our own failures and limitations? It's hard to know if Fitzcarraldo is mad at the beginning of the film or if he's going mad on the journey. He's an eccentric and maybe Herzog's point would be that we are mad for not chasing down our own dreams, for not allowing our own passions to consume us.